Kaunas is an eternal competitor for Vilnius. Being inferior to the capital in its size Kaunas can boast of the same quality and quantity of worthy places as Vilnius has. 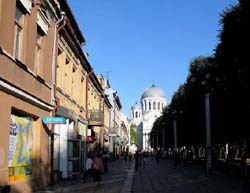 The Old City in Kaunas attracts people to its special atmosphere which is created by medieval churches and cathedrals, to its unique architecture of the 20-s – 30-s of the 20-th century and reminiscences of Kaunas church. A hand made beauty of this historical center is added by picturesque natural landscapes. Kaunas stands at the junction of two main rivers in Lithuania: Neman and Nyaris. Being unassailable and threatening some years ago, Kaunas castle has kept only the echoes of its former power – half of the wall and a tower. Being built in the beginning of the 14-th century the castle could outlive a famous battle of Grunwald. Truly speaking after the victory of Lithuanians over the crusaders the castle lost its strategic meaning. In 1655 it was practically destroyed by the Russian army. The historical center of Kaunas is contrasting. The monuments of the 15-th – 17-th century correspond with the architecture of the epoch of the first independence. Moreover the seamlessness of the city space isn’t practically destroyed. Among the constructions of the medieval centuries we can single out the building of ratusha (the 16-th century), a unique house of Perkunas from red brick which belonged to Ganzeiskaya merchants’ artel, the church of Holy Trinity and a majestic Vitovt’s Gothic church of the 15-th century which was built by a great Lithuanian duke in honor to the Virgin Mary who quiet unexpectedly saved him during the battle near Vroksl. The building of a “new Kaunas” took place in the 20-th – 30-th. In those times the city was lucky to acquire an official status of the capital of Lithuania for two decades. The main consequence is the influx of capital, massive construction and as a result the appearance of the region Zhalyakalnis. Well today the richest collection of Lithuanian architectural ideas of the beginning of the century from pseudo baroque to modern is gathered in this very region. It is famous for its funicular which was opened in 1931. The second funicular was added to the first one in 1935. The region was Alexotas. Among the sights which can’t be missed and practically impossible to be missed in Kaunas is the central street of the city – Laisves avenue with fountains, the Ninth fort (the defensive complex of the 19-th century) and also the most well-known Kaunas tourist fetish – the museum of devils. The last one is famous for everything what can be referred to several kinds of evil spirits beginning from trinkets and some pictures to panels and sculptures depicting different demons.